We offer development workshops individually tailored to the needs of the group. The workshop is designed to fuel creativity, help tap into one’s individual creative forces, unwind and unlock the self- regulation stress mechanism. Our wide spectrum of workshops nurture trust, foster openness towards other workshop participants and help improve team working skills. 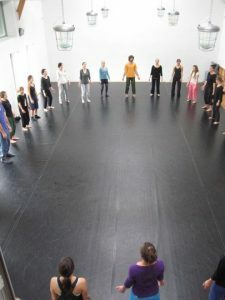 Our methods include working with the body and movement which draw on disciplines such as choreography, dance improvisation, movement and dance therapy, contemporary dance, yoga, authentic movement practice or mindfulness. We offer two catering options: two course dinners or full board (product supply for breakfast, served dinner and warm supper). 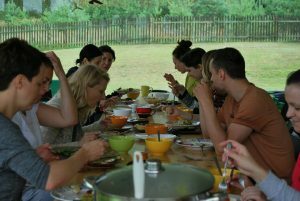 Depending on the groups&#39; preferences, the meals may either be traditionally prepared or vegan, always made from fresh local organic produce. Cathrine who has been preparing meals for our visitors for over 10 years will surely satisfy even the most fastidious palates. We will pass on the contact details to all our local organic producers of eggs, homemade cured meats and honey on request to all the guests who fall in love with our Masurian specialties.